Trust the experts at Precision Air for all your Heating, Air Conditioning, Radon, and Indoor air quality solutions! When allergens, radon, or inefficient HVAC are plaguing your home, you can be left with a space that's uncomfortable and unsafe. If you're unsure about radon levels in your home, or if you're thinking about changing out your heating or cooling, Precision Air is the company to call! In business since 1993, we have many years of experience performing radon mitigation and testing, indoor air quality testing, and HVAC services for homeowners throughout Greater Nashville. Our friendly, informative staff are dedicated to serving your every need. We pride ourselves on our expertise, our access to industry-leading products and services, and our exceptional customer care. 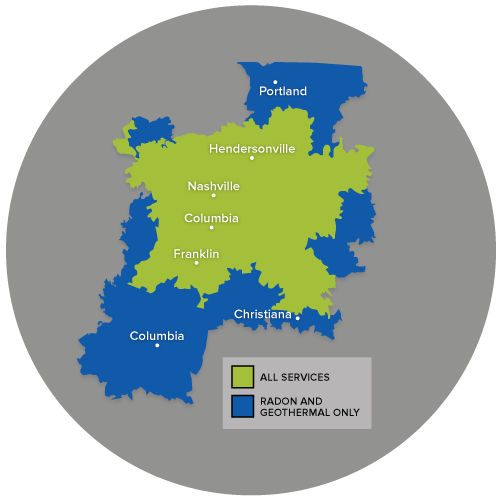 If you're looking to install geothermal heating, remove radon from your home, or pick out a new dehumidifier, Precision Air is here to help. "For years we heated our home using propane, and it was an..."
Our goal at Precision Air is to treat every customer the way we would expect to be treated, and to do things right the first time. We have maintained an A+ rating with the Better Business Bureau for 18 years. Backed with the support of National Radon Defense, a network of radon dealers with access to training materials, continuing education and more, Precision Air has the tools needed to permanently rid your home of radon and ensure the health of your family. But don't just take our word for it - see what our customers have to say! Free estimates on all new equipment! We offer complete solutions for all your home's HVAC and air quality needs. From furnace repair and installation to air conditioning services to radon mitigation inspections, we have the quality products and expert services your home needs. We specialize in improving home comfort, energy efficiency, and indoor air quality, and we can help you with whatever needs your home has. Precision Air's many years in business, our award-winning staff, and our use of the industry's best materials are just some of the reasons why homeowners count on us. As a family-owned, local company, we enjoy getting to know our customers, and we feel responsible for their safety - which is why we will never stop until the work you need is finished. Looking to get started on your new HVAC system, or in need of radon mitigation or indoor air quality services? Precision Air will make you and your home a priority as we work to make your home more efficient and effective. We offer free estimates for our services to homeowners in Nashville, Franklin, Murfreesboro and areas nearby. Schedule yours today!